The first iceberg we found on our way South, an impressive block of ice, many times larger than our ice-strengthened ship, and with a wonderful blue colour. The minute Cape Petrel (Daption capense) in the image gives an idea of the massive size of the iceberg. 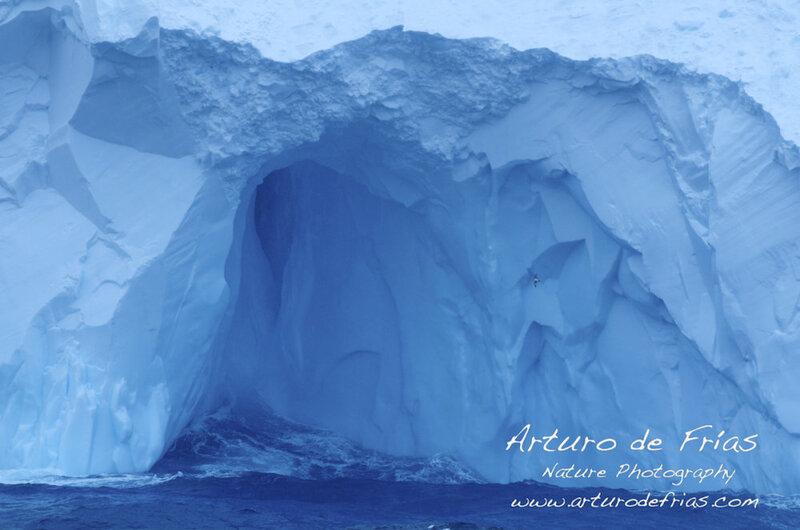 El primer iceberg que encontré en mi ruta hacia Antártida., un inmenso bloque de hielo, cientos de veces mayor que nuestro rompehielos, y con un maravilloso color azul cobalto. El Petrel del Cabo, diminuto en la imagen, da idea de las dimensiones del iceberg.